By the end of 2013, it appeared that the major domestic political story of the year had been the botched rollout and negative reaction, in some quarters, to the Affordable Care Act (ACA). It is likely, however, that a year from now the ACA will be more accepted as a real, but limited, improvement to health care policy in the US and that another issue will have emerged as the most important issue of 2013. 2013 was the year where issues of income inequality, raised by the Occupy Movement in 2011, stressed by Pope Francis and, belatedly, by President Obama finally came to the fore of American politics. It is likely they will remain there for some time to come. Income inequality is not new in American politics, but the attention it received in 2013 was. While President Obama\’s recent speech on the topic is unlikely to lead to significant efforts to address income inequality, it demonstrates that the issue is firmly in the mainstream, for now. Income inequality is different from poverty, an issue that is often discussed by politicians. These discussions, until this year, tended to frame poverty as an isolated issue growing out of individual or collective failings. Income inequality is different because it suggests that the problem is structural and deeply embedded in our larger economic system. Accordingly, income inequality is considerably more controversial and divisive than poverty. Almost everybody can agree that poverty is a problem and that we would be better off, both nationally and globally, if there was less of it. There are heated disagreements about the best ways to address the problem, with some calling for more state intervention and others calling for letting the market ameliorate problems of poverty, but most recognize the problem itself. 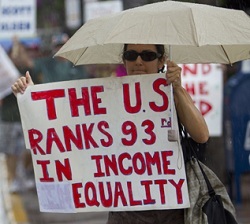 Read More Income Inequality in 2014 | Lincoln Mitchell. This entry was posted in News from the Soul Brother and tagged ACA, Affordable Care Act, commentary, income inequality, money, Obama, politics, Pope Francis, poverty. Bookmark the permalink.